We have over 10 years of experience working with WordPress and we've poured all that know-how into creating the best managed WordPress hosting solution available today. We use state-of-the-art technology like Nginx, PHP 7, LXD software containers, and MariaDB to make sure your website loads in the blink of an eye. Featuring complete resource isolation, automatic scalability, and high availability. We employ only the best technology at Kinsta, from our server hardware to the software we run. No matter what development stack you use, we’ll always have the latest framework versions installed and up to date. Powered by Google Cloud Platform and its 19 global data centers. Everything is interconnected over their premium tier network, designed to minimize distance and hops, resulting in fast and secure transport of your data. Moving your site to Kinsta won’t incur any downtime. Our expert migration team will take care of everything for you. We’ll assign a temporary domain to your migrated site and check everything before going live. Spend less time worrying about your website and more time growing your business. 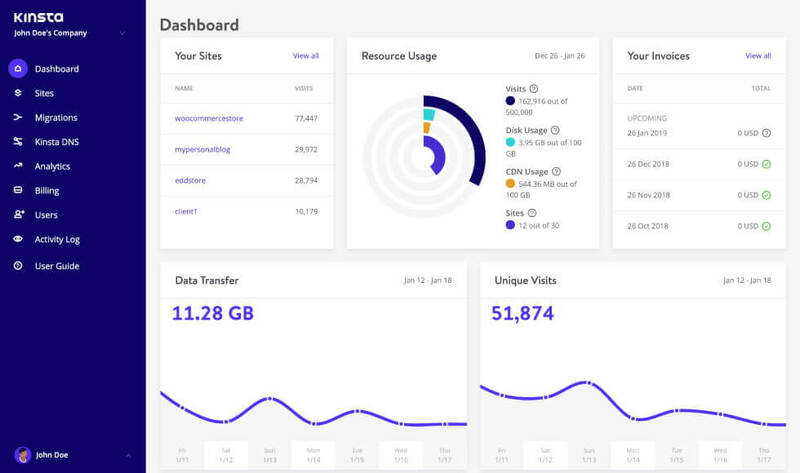 Whether you need to roll back your site or you’re hit with a sudden surge of traffic; Kinsta’s got you covered every step of the way. We check the status of all websites we host every 2 minutes. That translates to 720 checks for each of your sites every day. Our uptime checks allow us to react to issues before they affect lots of visitors. It allows us to be proactive in our support efforts. We backup your sites at least once every day. Should the worst happen you’ll be able to reinstate a backup of your site with the push of a button. We offer separate backups on all environments - live and staging - so your development efforts are equally as safe. For an additional fee we can increase the backup frequency of your sites to every 6 hours or even every hour. If you make frequent changes or have a highly dynamic site, this may be a worthwhile addition to your site's security arsenal. Our infrastructure is built on Google Cloud Platform which puts the power of Google's hardware at your fingertips. Your site can scale up to your needs, and the power is always there when you need it. Most importantly, we are ready for unpredictable traffic surges. Sudden spikes from social media or being featured on national television is no match for our server’s power. We don't just sit around waiting for hacks to happen. We keep all of our server software up to date and constantly monitor events network-wide. Suspicious activity is investigated and dealt with immediately. If your website is hacked we guarantee that we'll fix it for you with immediate priority. Our technicians have years upon years of experience dealing with all sorts of WordPress issues and will restore your site to perfect working condition. Providing fast and knowledgeable support has been our number one priority since day one. Instead of scripted replies, we have actual WordPress experts standing by 24x7 ready to assist you. At Kinsta support WordPress knowledge is not an afterthought, it's our number one priority. Our team speaks WordPress fluently, has experience in troubleshooting, server maintenance, theme and plugin building and maintenance, contributing to WordPress core, and more! When an issue is solved we share the knowledge internally. If an issue happens more often we share what we've learned in our knowledgebase to help you get things done on your own. We have clients from all over the world which means that we're available 24/7 no matter where you are. We'll tend to your issue as soon as we can, giving you feedback and clear communication along the way. Communication is key, both internally and externally. We use intercom - a unified comms system - which means that our support staff moving between shifts will always be up-to-date on your issue, so you never have to repeat yourself. We check your sites' uptime every 2 minutes which means that our response time is amost immediate to any downtime that may occur. Our staff is alerted instantly and they'll start resolving the issue well before you contact us. We monitor the status of our other external and internal systems just as rigorously. This keeps our servers healthy, allowing us to focus on continuous improvements. We emphasize the sharing of knowledge within our support department which makes us a well-oiled machine. Complex issues may call for teamwork behind the scenes, something our team is more than ready for. Whether your website is down, you're getting attacked, you have SSL issues, it makes no difference. If it is a problem on our end we will take care of it swiftly and professionally. 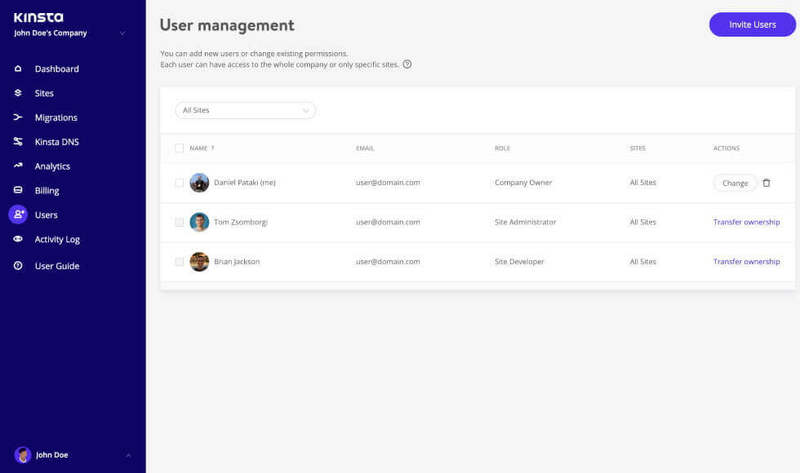 Kinsta’s platform and dashboard was designed with beginners in mind and yet it’s packed with advanced features and tools developers will love. Whether you want to add a new site, deploy a staging server, clone a WordPress site, view detailed site analytics or request a migration - it’s all there in one easy-to-use interface. For those of you coming from Cpanel or Plesk, you’ll have access to all the tools you're used to, but with a fresh approach. phpMyAdmin, redirects, logs, SFTP, and backups are all one click away. Strategically place your server geographically closer to your visitors by choosing one of our 19 Google Cloud Platform data centers for each of your sites. This ensures low latency for your visitors and lightning fast load times. You deserve nothing but the best. That’s why we utilize Google Cloud Platform’s premium tier network designed to minimize distance and hops, resulting in faster more secure global transport of your data. No need to worry about wasted development time on staging. When you're ready, you can one-click push changes you’ve made on your staging site to production in a matter of seconds. We are WordPress developers ourselves, so you’ll be happy to find everything you need under the hood. Tools and software such as WP-CLI, SSH, and Git are supported and ready to go from the minute you sign up. The latest supported versions of PHP 5.6, 7, 7.1, 7.2, and 7.3 can easily be enabled with a single-click from within the MyKinsta dashboard. This allows you the freedom to run what your third-party plugins need to operate efficiently. 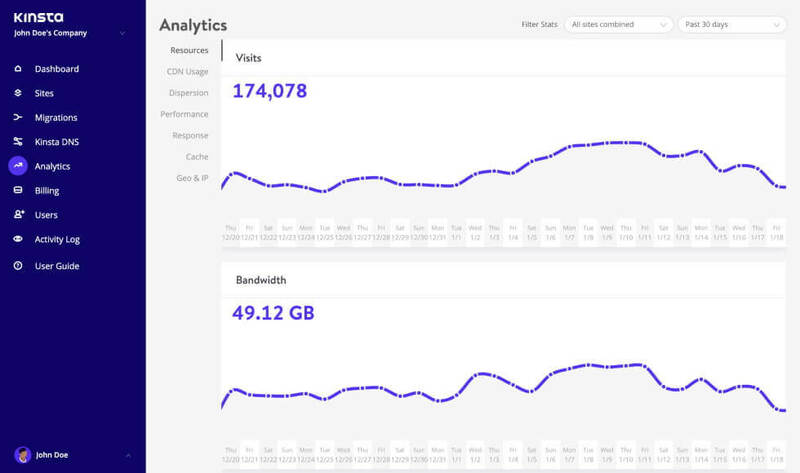 Our dashboard lets you track important data for each of your sites separately; such as visitors, bandwidth usage, response times, CDN usage, and more. How we optimize for WordPress, some more specific information about the infrastructure, developer features, feature updates, and more. We know you expect the highest quality. Don’t worry, we’ve got you covered! Working with large volume sites is our speciality. We serve billions of pageviews and bytes every month with absolute stability and uptime. We can handle anything you throw at us. WooCommerce sites are very demanding. 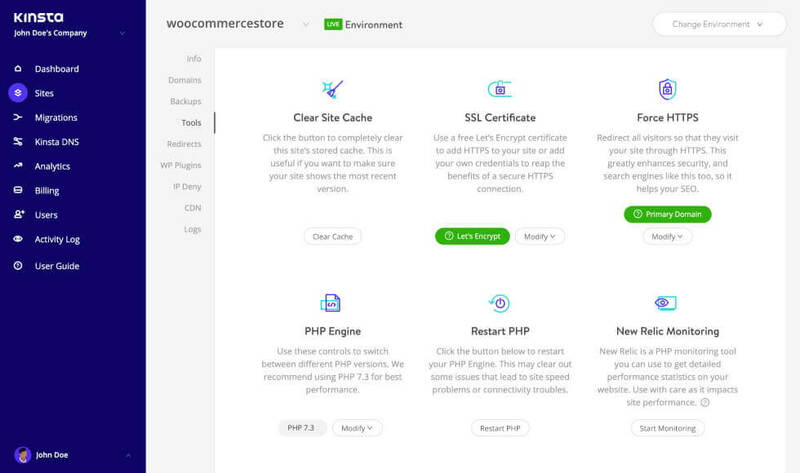 It is important when choosing WooCommerce hosting that you choose an optimized container-based host that is built for infinite scaling. Check out our plans from starter level to large solutions. Find what fits you, or contact us if you need something special!